Mon-Th: 8am-5pm; Friday 8 -4. All of our technicians are certified applicators. Whether you're a homeowner or commercial or industrial client, Stuart's offers the pest control service you need for both interior and exterior concerns. We have the experience and effective procedures necessary to handle roaches, ants, silverfish, spiders, termites, rodents, fleas, mosquitoes and many other pests. Count on the pros at Stuart's for all your pest control needs. Great customer service. Was referred to them by neighbors who have used them for years. Use them for maintenance and have had no issues at all. Very happy. We did some construction tearing out back patio up against the house. Stuart Pest Control was on stand by for a week not knowing when the concrete would be set and ready to pour. They changed days several times and then came out at the last minute immediate response on a Saturday to spray just before pour. They went over and beyond exceptional service. So proud to have them providing continued pest control service. Thank you Trish and your guys who have serviced our homes over the years. I was very please with how timely the personnel arrived at the scheduled time. The employee was very knowledgeable of the work being done and explained in detail how the products being placed would work. It was a great relief to have that information. Service is always wonderful. Ron is always efficient and has beautiful character. I love this company!!! I’ve used them for 20 plus years!! Great service and customer service. 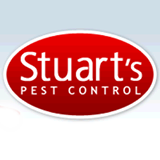 We've been using Stuart's Pest Control for at least 45 years. Couldn't be happier. Great service! Always prompt and extremely professional!! Always a pleasure and great service. Thank you! Always fast and reliable to do a great job. Customer service is always friendly and courteous! I would highly recommend Stuart’s Pest control to anyone looking for great and affordable pest control service! Professional, friendly, punctual. Great service. Always a good job done. No bugs! Professional, friendly service... from office and field reps! Great, excellent, friendly and effective service! Thank you! Always do a great job. Polite staff. On time service. Great service and knowledgeable about of questions we had. Stuart's Pest Control is a very professional business with dependable, knowledgeable and punctual office staff and technicians. We have used their services for several years with no plans to ever change! Stuart’s have been treating my house for 11 years. They have been always on top of things, including warning us when our water was about to fail. (They were treating our attic at the time.) I will always recommend them to our friends. Happy with the service. Have had no problems. Everyone is friendly and courteous. Great people. Very knowledgeable about pests. Honest and helpful! They won’t charge you for things that don’t need to be, even if you called them out to check the pests. Dave has always been a pleasure to work with. Trish is great at communicating and scheduling based on relevant weather conditions. I am very pleased with Stuart's Pest Control. The chemical is odorless and highly effective. We had the service a couple weeks ago. We were bombarded with ants in our kitchen. We would feed the cats and in minutes they would show up to attack the bowls. Called and got an apt, serviceman was on time friendly and thorough. So far so good, no ants! I have used you many years because You do a great job !! Treated for ants. Thorough, haven't seen an ant since. Even killed the dirt dobbers somehow. That was a plus! Good pleasant tech. Anxious to see how often treatment will be required. We are very pleased with the service....thank you. There is no one else we would trust with our exterminating. They work with our schedule, and Greg, our technician is always so friendly.